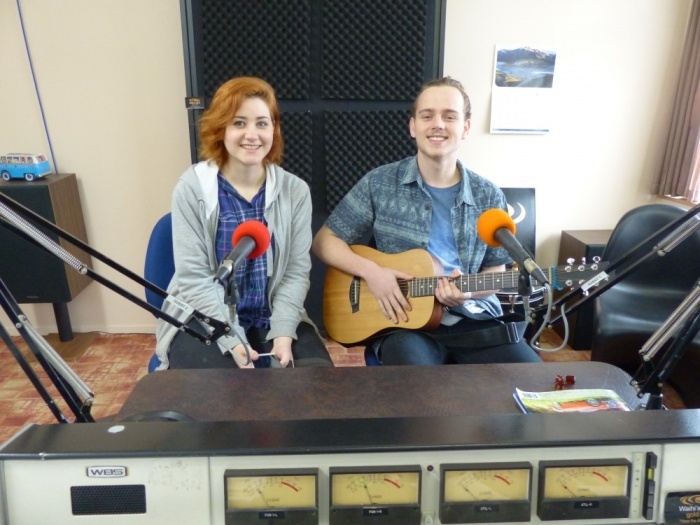 It was our pleasure to welcome Kristian Lund and Mikayla Wiltshire to Gold FM this morning. Kristian is passionate about music and already has a large catalogue of songs he has written, sung and self-produced. Seventeen year old Kristian has just completed NZCE Level 2 at Waihi College and is ready to get a job so he can pay for a music course in Tauranga next year. Mikayla is 22 and is already doing an art and design course in Tauranga. Kristian has been singing since before he could talk and has been playing the guitar from the age of six. Mikayla comes from a musical family that enjoys singing with one another and since Kristian and Mikayla met they have been making 'sweet music' together. Kristian described his music as similar to a combination of Ed Sheerhan and Hozier and said big influences for him are Ed Sheerhan and The Beatles. Kristian and Mikayla have just written a new song called 'Plus One' which is about a couple expecting a first child. Kristian assured us the song wasn't about them, it's a topic that Kristian said doesn't really get covered in the song writing world. We wish Kristian and Mikayla all the very best for their futures. It's great to see young people following their dreams and prepared to work hard to do what they love. Click play and listen to the full interview and hear the first public performance of their new song 'Plus One'.